Keeping the correct records and having the correct references means you’ll have a well-organized, highly productive, efficient organization. Such a well-ordered office starts with the right office forms and business forms, ledgers, books, and more. Then you need the proper reference materials, globes, time clocks, human resources materials and medical business forms. Organization is our specialty. 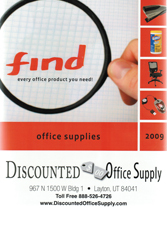 With the supplies below from Discounted Office Supply.com, you’re ensuring that your company will function with high productivity and high standards. As the premier online retailer of janitorial and office supplies, we serve the continental United States from our 36 geographically located distribution centers. We offer great prices, a large selection and superior service. Organize your records today!